On the 24th April 2004 Steven Falk visited Kemerton (Kinsham) Lake area on the south side of Bredon Hill and recorded an outstanding community of solitary bees (Aculeates). 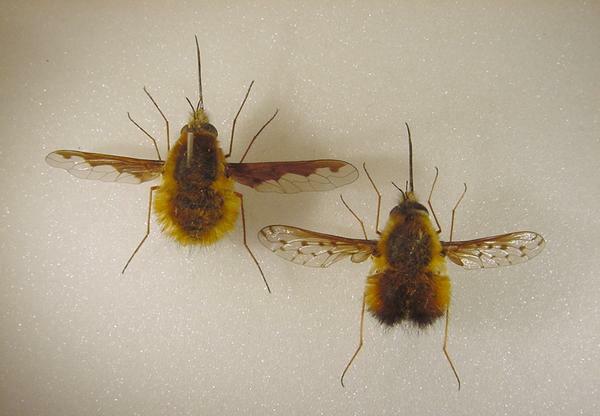 He also obtained the first modern Worcestershire records for the Dotted Beefly Bombylius discolour (two seen). This species was once “not uncommon in southern England” but declined markedly. (Stubbs & Drake 2001). It may now be increasing again (see below) especially as its main host Andrena flavipes is also extending its range – there is a very large colony at Kemerton. Historically, the only records we have are of three specimens in the Worcester City Museum, collected by John Edward Fletcher at Middleyard Coppice, near Bransford, on 19th and 24th April 1872 and 2nd May 1880. Interesting; although Fletcher compiled extensive lists of insects for the Worcestershire Victoria County History, volume 1, published in 1901, there is no list of Diptera despite the fact that his own collection contains large numbers of flies. We have looked for B discolour at Kemerton in 2005 and 2006 without success (the weather during our visits was not ideal). However, on Sunday 7th May 2006 I obtained a second modern record for Bombylius discolour at a small old gravel pit SO977361 on the NE flank of Bredon Hill near Beckford. This site is actually in VC 33 (Gloucestershire) although it is in modern Worcestershire and within our recording zone of Greater Worcestershire. The general feeling is that B. discolor has been expanding in recent years, especially within the Cotswold area. In the mid 1990s it seemed to turn up at a lot of sites here, especially at Andrena cineraria colonies in limestone districts. Now that Adrena flavipes is becoming widely established in the Midlands (seemingly the main host for discolor nationally), I would expect discolor to continue to expand its range within and outside limestone districts as we have seen at Kemerton. I'm currently surveying downland in E. Sussex and B. discolor is pretty common there, much more so than Bombylius major, and clearly linked to A. flavipes. It a lovely beast - females can be quite large and have a habit of buzzing loudly close to me as I look for aculeates. I often hear them before I see them! It follows that it is well worth keeping a lookout in Worcestershire for this striking beefly. It is similar in size to the familiar Dark-edged Beefly Bombylius major (even a little larger). The front edge of the wing is partly darkened though not obviously so as in B major. The characteristic feature is the scattering of dark dots throughout the wing which is otherwise clear. To see these features, wait for the beefly to settle as they are not obvious when the insect is hovering. Both species fly in the spring and often hover very close to the ground as soon as the air temperature rises in sunny sheltered spots. A temperature of over 17˚C is required to enable them to fly (Stubbs & Drake 2001). STUBBS & DRAKE M. 2001. British soldier flies and their allies. British Entomological and Natural History Society. Dark-edged beefly Bombylius major (left) and Dotted beefly Bombylius discolor (right). Picture kindly provided by Steven Falk ©.